We will send you an email with reset instructions. Middlebury, CT (September 8, 2017) Villa Radiology, the digital imaging, and practice development solutions provider, proudly announces the availability of the Prime Panoramic Digital X-Ray. Villa developed the Prime to redefine a new standard in Panoramic X-Rays. For those familiar with Villa, the new panoramic packs value into a compact, entirely wall mounted and baseless frame, all for a limited investment. Together with the company’s Lifetime Warranty1, Best Total Cost of Ownership, and PRONTO! OnDemand support ecosystem, the Prime competes with the biggest players on the market. 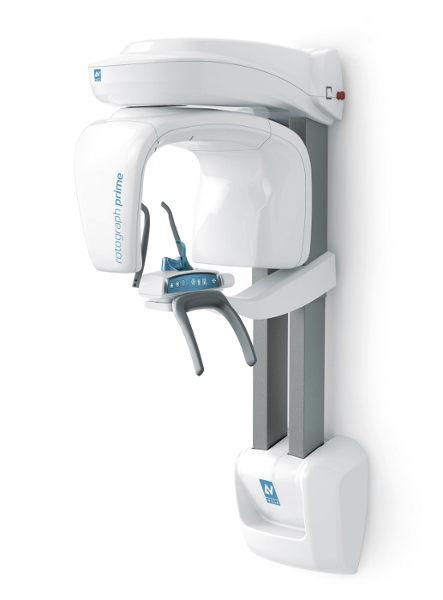 Part of Villa’s new promise is that of a universal imaging platform, from 3D/2D pan/cephs, to intraoral sensors. The Prime footprint is small and light at an unheard-of 136 lbs. This is about half the weight of the industry’s top competitors. Delivered as one piece, one technician can easily install the Panoramic for immediate operation within a spare operatory or any unused office space. Simply slide to the wall, secure and lift Prime as one assembly, all in a fraction of the time of traditional floor mounted systems. Practices can now install and routinely use a panoramic X-Ray in tight spaces that are traditionally not an option in a crowded, busy practice. The Villa Prime makes incorporating that much needed panoramic X-Ray an affordable solution, without any compromise to image quality. Villa’s engineering team designed Prime to advance the positioning, technical support, training and overall patient experience. The main controls are primarily digitized via the intuitive GUI on the capture program, allowing for easy training and operation (watch the video!). This design compliments Villa’s PRONTO! OnDemand support ecosystem. Standard with all new Villa products, PRONTO! (meaning “Ready” in Italian) revolutionizes support and training by utilizing an iOS / Android compatible app and desktop agent for immediate and direct rapid response support. Dental teams can directly contact a Villa Representative on their preferred device, at their convenience through their own dedicated chat room. If needed, initial and follow up trainings on software or product are a breeze with PRONTO! The user simply reserves any available slot on the PRONTO! web page. The combination of Villa’s Lifetime Warranty, Best Total Cost of Ownership and PRONTO! OnDemand support helps differentiate Prime in the increasingly saturated market. The Prime Panoramic Digital X-Ray is now available in the US, Canada, Mexico, Latin America and the Caribbean. Discover more about the Prime here. Oxford, CT (July 18, 2017) - What are your expectations regarding product support for your practice? According to an article by Forrester, customers would rather not call at all for support, and it’s clear to see why. Marketwatch.com estimates Americans will spend 43 days of their life on hold. Remote login software and desktop agents offer an escape from this statistic, by putting us “at arm’s length” to the support provider. But are they used properly? Despite the promise of rapid response, assistance isn’t always truly immediate, nor an intelligent solution to the problem. If we are forcing staff members to hold on a call cue, wait for (and likely miss) call backs or wait days for a trainer to travel to the office, how advanced could our support really be? These methods only convenience the dealer / support provider and office productivity irrevocably suffers. The cost of bad customer service affects the practitioner as well as the support provider’s reputation and trickles down to the patient’s experience. It is amazing we still accept it as standard. Knowledge bases are a great way of self-help. CallCenterHelper.com outlines 49 Tips to reduce AHT. Three of these tips relate to availability of a knowledge base on common issues. But what about the next level idea that encompasses all of these tactics in real time? What about case specific knowledge, delivered immediately to the best staff member on their preferred device? One dental provider has done just this. Villa Radiology, the Dental & Medical Imaging, practice development and solutions provider, utilizes a rapid response ecosystem with desktop agent and IOS / Android capability. Villa coined the name PRONTO! (meaning ready in Italian) because the practice has the option to directly contact the manufacturer support through the ecosystem. PRONTO! works by utilizing video and audio and can be accessed on any screen using most operating systems and browsers. Staff can schedule remote training convenient to them during any open time slot. If there is a product issue, a staff member can send a screenshot, photo or video from their phone and an immediate solution to the specific problem is provided by a factory trained agent. If the problem cannot be resolved at the staff’s convenience, an agent is available to escalate the case. In the digital age we are quicker and smarter and investing heavily into our support platforms. Support providers, in turn, must deliver smart, convenient support and training as rapid as they deliver their product and bill their customer. For the practitioner, staying invested in next level support is critical to maximize daily production. This results in less time spent on the phone and more energy spent on patient care. We kindly invite you to discover all features of this product in its dedicated page of the website.